Ye who have a spark in your veins of cockney spirit, smile or mourn acccording as you take things well or ill;— Bold Britons, we are now on Shooter's Hill! Cinema! Theatre! Live Music! At one time all these were available to the residents of Woolwich, but no more. It is our hope to set up an arts centre in the old regal cinema on Wellington Road, previously the N-tyce night club, in order to provide acccess to the arts for the local community. The regal cinema used to be a place of civic pride when it opened in 1955. A small group of local artists are hoping to run the old cinema as a place for the local community to enjoy – their aspirations for the area have however met with some difficulty, as the Christ Apostolic Church, which already has 10 venues in London, has taken out a lease from the council. The church has apparently agreed to find a way of sharing the cinema space between its prayer meetings, and the group are trying to achieve the backing of the council to return this old cinema to its original function as a civic amenity in an area that has already given over two of its beautiful cinemas to gala bingo and the new wine church (I have to say that the new wine church have done a good job of renovating the old odeon, although I didn’t feel especially welcome when I sauntered in one Saturday afternoon – but access to the magnificent bingo hall is even more difficult). 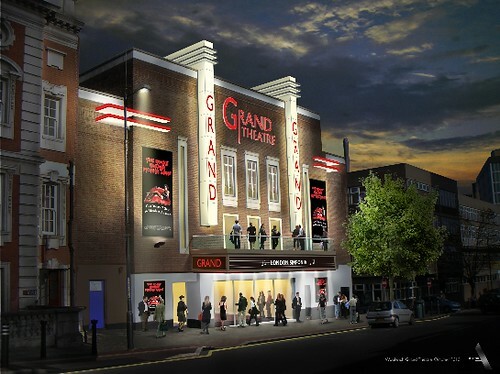 Cheese and wine will be available, turn up for a chat, a tour, making connections and a chance to hear future plans for the The Woolwich Grand Theatre. It would be wonderful to be able to get in to one of Woolwich’s glorious old buildings, even better that it would be a real cinema and live performance space for the local community. The theatre has a website www.thewoolwichgrandtheatre.com/ and a facebook page, where more can be found out about what the group are doing at the moment, mainly painting the front doors it seems! The Newsshopper’s Nina Massey recently published a report on the local opposition to the pavement widening at Brinklow Crescent (which according to the paper is in Eltham, oops, wonder how that mistake happened!). Brinklow is a `true’ crescent, and its semi-circular shape curves round the hillside elegantly to meet Plum Lane at each tip. Both junctions have been modified, although it’s the changes on the west side that seem to be causing the most controversy. Apparently someone from the council is going to meet the residents to talk this through. GREENWICH Council has apologised to residents for failing to consult with them over residential roadworks. No consultation was carried out before roadworks started on April 4 to narrow the entrances to Brinklow Crescent in Eltham. Mother of two, Inderjit Gill, said: “We just don’t know why they’ve done it and what is even worse is that we weren’t consulted. 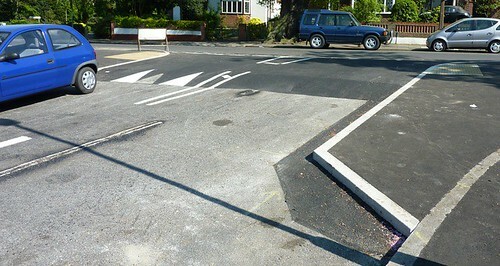 Greenwich council has said the works were carried out to improve safety for cyclists and pedestrians. Paul Revel, a web editor who has lived on the road for almost 10 years said: “In all the time I’ve been living here, I have not witnessed any issues with pedestrian or cyclist safety. 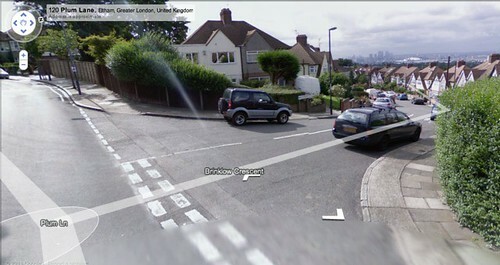 Here’s some photos of what it used to look like, (taken from streetview pictures which were I believe last done in 2009). This is the western tip of the Crescent, as can be seen it is quite wide for pedestrians, although apparently it’s historically safe, and there’s no official record of any accidents there going back as far as 1995. Here’s what it looks like now. This is the eastern tip of the Crescent, it certainly has a commanding view of casino wharf. Again, according to records, pedestrians here also appear to have been historically good at car avoidance. So, altogether this raises two questions: (a) why did these road safety works happen when they did – are they part of a wider plan for the area? (b) why haven’t members of the community been involved – if they had been, would it have been done differently, or at all? 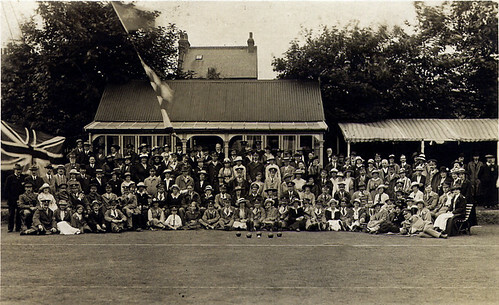 The bowls club in 1922. 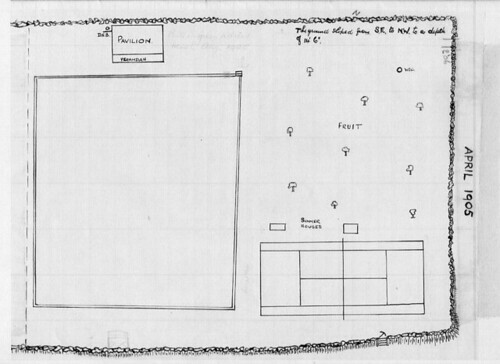 Woolwich and Plumstead B.C. are holding a series of free sessions to attract new members to the club and build awareness in the sport of Lawn Bowls. Bring Family, Friends and a pair of soft-soled shoes. Bowls will be available for you to use and there will be Members on hand to show you the basics and to answer any of your questions about the game or the club. 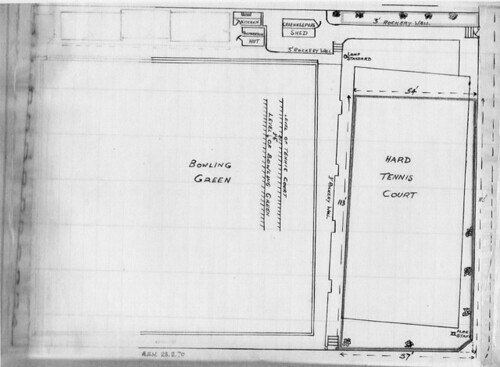 I often used to wonder why the sign over the gate used to describe the place as a bowls and tennis club … well, there were tennis courts squeezed in there at one point, and it even had fruit trees at one point. 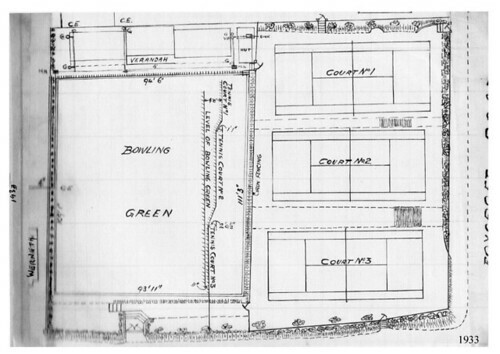 It’s interesting that the bowling green survived the reduction in size of the club; perhaps the tennis players moved over to where the current lawn tennis club is on Eaglesfield road? The farm is currently at the height of Lambing Season, with 42 lambs born as of midday today! April is quite an exciting time for Woodlands with lots of other things going on, and we did do a post on this a while back…but to briefly recap: there’s (a) Easter Holiday family activities on Tuesdays-Fridays; (b) The Lambing Day on Saturday the 23rd; and (c) another “Things that go bump in the night” event on Tuesday the 26th. We have a café run by volunteers in the Education Centre, weekends only, 12pm-4pm, from 30 April to 30 September (closed 9 July). Hot and cold drinks, snacks and second-hand books for sale. Bluebell Walk. Meet at Oxleas Woods Café at 2.15pm for a walk led jointly by the London Wildlife Trust and the Woodlands Farm Trust. No need to book. FREE, but donations welcome. Spring Bird Walk around the farm. Meet in lower farmyard for a 10am start. Duration 2-3hours. Will be cancelled if there is heavy rain. No need to book. FREE, but donations welcome. Stag Beetle family activity day with the Education Team. Learn about and meet real stag beetles! Drop-in activities from 10.30am-3.30pm, no need to book. Mostly free; there may be small charges for some activities to cover materials. Sunday 10th July, Summer Show, 11am-4.30pm. All are welcome at the Woodlands Farm Trust Summer Show. Come and meet our animals, and enjoy the chance to buy quality local produce at reasonable prices, including home-made preserves, cakes and honey. Relax in our café or enjoy something from the BBQ, get involved in craft activities and games, and enjoy displays of country crafts, falconry and ferrets. Entry is £2.50 adults, £1.50 concessions and £1 children aged 4-16. Children aged 3 and under go FREE. All proceeds go towards caring for our animals. A great family day out! Apple Day, 11am-4pm, FREE. Ties in with National Apple Day. Apparently, work has recently started on the venues, without so much as a by-your-leave from anyone in the local area, although apparently there has been a `consultation’ (an increasingly spine chilling term). I wonder how many people actually went. Some hoardings are now up on Woolwich Common, surrounding the site of the shootings to be, and here’s a look at the cheesegrater style architecture that’s going to be built on the common, and then taken away. No news what’s going to be left behind once they’ve gone, although I hope the Olympic people leave the common in the same shape they found it (i.e. pretty much as nature intended, bar the odd lawnmower and circus camel). The view of the paralympic archery venue, looking westwards along haha road. Thanks to @grantblowers for sending me the news release, and 853blog who wrote about this earlier today, also pointing out that ha-ha road and circular way will be out-of-service during the games, meaning that bus routes to the hospital will presumably be redirected via Charlton way – again this is the kind of thing that a more transparent (i.e. 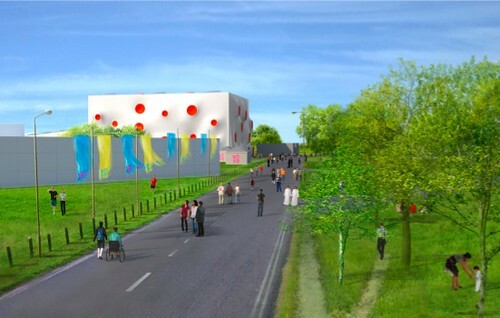 known about) consultation process could bring to people’s attention so they don’t find out in Summer 2012. More can be read about what’s happening in the first issue of Engage, the Olympic news release for our area. Woodlands farm are having a series of night-time events starting tonight (see the calendar), including some observations of bats and moths. I know one of the Shooters Hill photographers will be there, so it’ll be interesting to see if any photos of the local nocturnals come out. In other news, the website has been selected by the Guardian’s Dave Hill for inclusion in the top london blogs, which is encouraging…although possibly as a result of this the website has gone down (again) due to over-demand. The site has never had the capacity to handle more than a few visitors due to the principles of incurring no costs whilst remaining independent of hosted blogs; the downside of this is that the site has relied on the crankiest, wobbliest web hosting imaginable, although it has been a wonderful thing to publish web code for free. However, the need to move the site onto a steadier server has been pressing for some time, and the issue has finally come to a head. Anyway, the new home will be eshootershill.wordpress.com, and the current site is being phased into that one, with the final touches being made on the last day of June, it should be fairly seamless, at least I hope it is, if nothing else, people that read this via the email/rss subscriptions won’t need to change anything.